This is a simple way to share the message of Jesus. Business card-sized, it fits in a pocket easily. Used in schools, prisons, on trains and in aircraft… it illustrates four points. 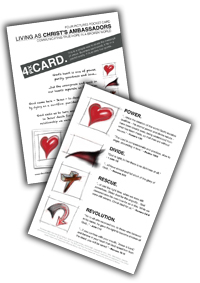 Notes to help explain the “Four Picture Card” – click here to download and print. 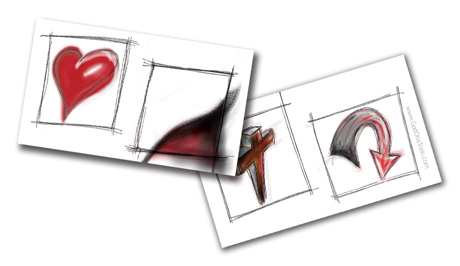 These notes are free to download in pdf format and are convenient for printing. For ease of printing, use a “duplex” printer and choose the option, “booklet printing”. The double sided sheet can then be cut in half to make two leaflets sized A5. If you don’t have a duplex printer, set the printer preferences to fit two pages on an A4 sheet and turn the paper over to print the back.